The US has a more efficient livestock production system. According to the 2006 US EPA report, US agriculture causes less than 6% of US greenhouse gases, while livestock causes only 2.58% of US GHG. The UN says 18% of *global* GHG is due to livestock. We should resume consumption patterns and keep the industry competitive; otherwise we’d be importing more meat from less GHG efficient livestock production systems, and cause MORE global warming. The argument exploits very misleading and incomplete statistics and rests on some flawed assumptions. In the final analysis, what matters is the total VOLUME of American consumption & GHG production, and factoring in livestock’s land and land-use. Below are some facts which point to how the US livestock industry is definitely a major contributor to global warming. 1. The US consumes FAR more meat / animal products than most of the world. According to the UN FAO, the average American eats about 275 pounds of meat per year (more than any other country). The average Chinese eats 108 pounds per year (Earth Policy Insitute, 2005). According to a 2005 FAO study on meat consumption between 1998 – 2002, the average meat consumption per Chinese is 52 kg, compared to Americans at 125 kg, and Britain at 80 kg. note: there are smaller countries which (on average, per person) consume a little more meat than the US – 300 mil. people (for example: New Zealand – 4 mil. people, Denmark 5.5 mil. people, and some countries which consume around the same amount of meat. If the whole world ate meat at the American rate, only 2/5 of the world’s population (2.5 billion people) would be fed (Lester Brown). So much for American efficiency. The world’s leading consumers of meat and animal products share the biggest responsibility for continuing to make the global livestock industry grow! As long as the meat industry continues to be supported by a growing culture of high volume meat eaters, the industry will be able to expand its reach globally. What’s more, the developing world seems to be falling in step, Popkin says. In India, meat and dairy intake more than doubled between 2000 and 2005. In 2006, the average diet of 67% of the Chinese population comprised at least 10% meat and dairy products, up from about 39% of the population in 1989. “We truly did this to the globe — changed the way the world eats,” says Popkin. 2. The US produces FAR more GHG than most of the world. The U.S., with a population of about 300 million (5% of the world), produces about 18% (2009 US EPA) of GLOBAL greenhouse gases. 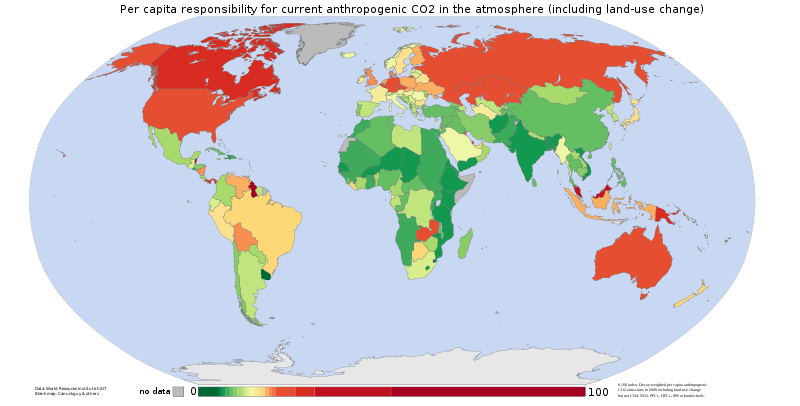 Consider the image below which portrays the CO2 responsibility PER CAPITA by country between 1950-2000. Even though China as a whole produces more CO2 as a country (since recently), their per capita emissions figures are STILL 1/3 – 1/4 of the US population (China recently officially surpassed the US in producing GHG, but China has 4 times the population (China has 1.3 billion people, US has 300 million people)). It’s a huge difference. So what does this tell us about the EPA’s estimates on livestocks GHG impact? We can predict that X% of US GHG per capita is far greater than X% of China’s GHG per capita. Basically 2.58% of US GHG is much more than 2.58% of China GHG (or most other countries). 3. The US EPA report does not include land-use (deforestation, desertification) and other criteria used in the UN FAO report. As I explain in a previous post, the EPA report excludes the whole GLOBAL livestock commodity chain including fuel combustion, agricultural CO2 fluxes and land-use changes (such as deforestation), while the UN report includes these factors (as its a global organization, and land-use is probably difficult to quanity on a country level). “(livestock) accounts for nine percent of anthropogenic carbon dioxide emissions, most of it due to expansion of pastures and arable land for feed crops. The livestock sector is by far the single largest anthropogenic user of land. Grazing occupies 26 percent of the Earth’s terrestrial surface, while feed crop production requires about a third of all arable land. Expansion of grazing land for livestock is a key factor in deforestation, especially in Latin America: some 70 percent of previously forested land in the Amazon is used as pasture, and feed crops cover a large part of the reminder. From these figures we know that the U.S EPA omitted a huge cause of GHG from the livestock industry. 1. US meat consumption per capita is higher than most of the world’s. 3. The US EPA report does not factor in the #1 cause of CO2 emissions from livestock: land and land-use (2.5 Giga tonnes). The US livestock industry’s share of the GLOBAL livestock industry’s greenhouse gases is much higher than the industry (whose prime consumers are Westerners) is willing to admit. It’s hard to calculate an exact figure, but we know the leading consumers and producers of meat also support the growth of a global livestock industry, which contributes most of its GHG through land and land-use. Meat and Global Warming: Is There Really a Debate? It’s upsetting and a bit disturbing that a NY Times “Green blogger” has perpetuated a claim from the Center for Consumer Freedom that there is no strong connection between meat and global warming. The recent NY Times article titled “Meat & Climate: The Debate Continues” (which I refuse to link to) cites a press release from the CCF (a.k.a a front group for the restaurant, alcohol and tobacco industries) which used an EPA figure estimating that only 6% of US greenhouse gases are caused by agriculture production, including meat. They used this figure to argue that there is no significant connection between meat and global warming. The EPA figure stands in stark contrast to the 2006 UN FAO report (Livestock’s Longshadow) which attributes 18% of global greenhouse gases to livestock production. Considering how much meat Americans consume, I find it hard to believe that the US produces far less GHG relative to other countries. If you read the first paragraph of the study, you would learn that the EPA figure omits the emissions from CO2 and land-use changes. In contrast, the 2006 UN FAO study includes CO2, as well as methane and other greenhouse gases as a result of the entire livestock production process. …Scientists usually tie their estimates of the greenhouse gas emissions responsible for global warming to sources such as land use changes, agriculture (including livestock) and transportation. The authors of Livestock’s long shadow took a different approach, aggregating emissions throughout the livestock commodity chain – from feed production (which includes chemical fertilizer production, deforestation for pasture and feed crops, and pasture degradation), through animal production (including enteric fermentation and nitrous oxide emissions from manure) to the carbon dioxide emitted during processing and transportation of animal products. Why the EPA chose to ignore the impact of CO2 and US land-use changes, is a puzzle to address. As the UN report shows, land-use is a major reason why GHG from livestock is high. When one looks at the example of deforestation of the Amazon (80% of which is attributed to livestock), it’s not hard to see why global land-use, and the whole livestock commodity chain should be a concern.